Identification: Wings are nearly translucent, especially near the body. 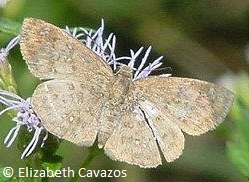 Upperside of wing is gray-brown with a complex pattern; forewing has 8 or 9 small transparent spots. Underside is gray-white with thin dark bands. Flight: February-May and October-December in South Texas. Caterpillar Hosts: Hibiscus in the mallow family (Malvaceae). Adult Food: Nectar from flowers including lemon blossoms. Habitat: Tropical scrub; lemon groves in South Texas. Range: Argentina north through mainland tropical America to Mexico. Periodic resident in the lower Rio Grande Valley of Texas. Conservation: Monitor and conserve populations in the lower Rio Grande Valley.